Sunrise Math 100 lays a foundation for all major math concepts the student will meet during his lifetime. Each lesson introduces one or more bite-sized new number concepts. Most of the student work consists of continuous mixed review to ensure that the concepts stick. The child experiences math as a whole rather than as isolated skills. Interspersed with basic number skills are forays into geometry, the Canadian money system, mental math, and number patterns. Canadian spellings and coins are used throughout this course. Practical story problems with a Biblical worldview relate math to real life. The U.S. and the metric measurement systems are emphasized equally. Daily speed drills, oral drills, and flash-card exercises help cement the basic addition/subtraction facts from 1-20. The Teacher’s Guide is comprehensive and easy to follow, even for the beginning teacher. 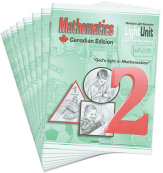 LightUnit answers are included in the teacher's guide. 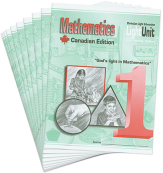 Canadian Math LightUnit 201 can be used as a diagnostic tool. It reviews concepts that should be adequately mastered in Level 100 in order to succeed in Level 200. The remaining nine LightUnits guide learning in new skills and concepts such as telling time, reading simple graphs, adding/subtracting multi-digit numbers with carrying/borrowing, working with Canadian currency, basic fraction concepts, and measurement in both the U.S. and metric systems. Canadian spellings are used throughout this course. Daily review on the addition/subtraction facts from 1-20 ensures continued mastery. Multiplication is introduced in Math 206, and by the end of the course, students have memorized the tables for 0, 1, 2, 5, and 10. Each lesson contains a realistic story problem or two on a theme (which varies with each LightUnit) such as pets, grandparents, and springtime. The Teacher’s Guidebooks are comprehensive and easy to follow. LightUnit answers are included in the teacher's guides, along with useful tips and alternate LightUnit tests. This single LightUnit covers Canadian history, geography, and government from a God-honoring perspective. It contains 42 lessons plus 23 special activities related to the child’s own province. These special activities are to be completed when directed, and compiled in an individual student project folder. The teacher’s guide includes vocabulary quizzes, reproducible outline maps, and a glossary. This course is based on the history textbook A Goodly Heritage, compiled by the parochial schools of Ontario, Canada. 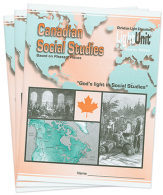 The first five units guide the study of the textbook which covers Canadian history to the time of Confederation. The teacher's material includes help for teaching the course and alternate Lightunits tests. This course is based on the history textbook Pleasant Places, compiled by parochial Mennonite schools of Ontario, Canada. The first five units guide the study of the textbook, which covers Canadian history from the time of Confederation through the 20th century. 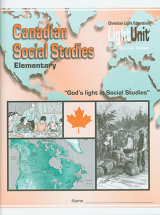 · A study of the Christian school movement in Canada and the U.S. The teacher's material includes help for teaching the course and alternate Lightunits tests, and reproducible outline maps.